What is a Duet Switch? A Duet Switch is designed to allow your Fax Machine to operate with a Distincyive Ring service service, which is usually available from your normal telephone service provider. A Distinctive Ring Switch provides you with a second number on your existing line. This service costs much less than normal monthly Fax line rental and will save you 1000's in rental charges. There is generally no connection charge and the new number becomes your Fax Number. When Fax calls are made to the new number, a different ring is sent which Duet Switch will detect within1 Ring. It then connects the incoming Fax call to your Fax Machine. Provides for Basic Home Use. Is ideal for sites that use telephones connected to a single telephone socket. Quick and Easy User Installation. Provides Enhanced facilities ideal for sites that use telephones connected to one or more telephone sockets. If you wish to use a different number for your Fax. When you already use a Distinctive Ring service and your new device does not support it. If you use Exchange based Voice Mail service. Note : If you are using a PBX Phone System, you will need to use our FaxSwitch 2 device. Why Use a Fax Switch or Duet Switch? Fax Line Monthly Rental is constantly Increasing. 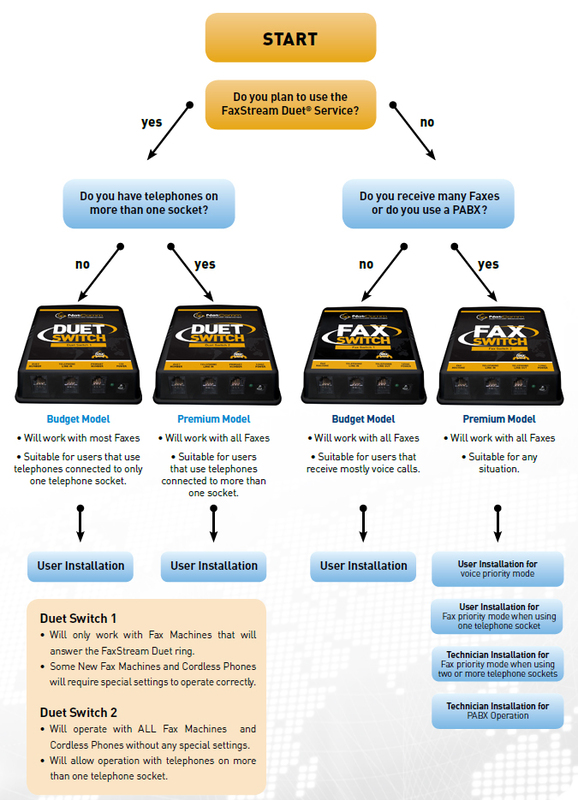 Fax Line Installation Costs are Increasing. Fax Use is decreasing and many Dedicated Fax Lines get little use. Because a Natcomm Switch will provide you AND your Fax Callers with a Reliable, Fully Automatic Fax Reception solution. User installation under all circumstances. A separate Answering Machine (if used) can be connected to the same socket or any other socket on the line. If ADSL is used on the same line, then an ADSL filter should be fitted ahead of the switch. Because it will SAVE YOU MONEY - Save up to $1000's in line rental in just a few years! Our Fax Switch and Duet Switch products are designed to operate with an ADSL service. They will not affect your ADSL service and your ADSL service will not affect the operation of our Switches. It is essential that you use a High Quality ADSL Filter/Splitter somewhere on your Telephone Line ahead of our Switch. We recommend the C10 brand ADSL Filter/Splitter, available from most telephone equipment retailers. Your Reseller can advise you of other suitable filters. Our Fax Switch and Duet Switch products are designed to operate with a CallerID service. If a CallerID telephone is to be connected direct to your Fax Switch or Duet Switch, you can quickly and easily enable the unit to pass CallerID to your telephone device. Our products are designed and guaranteed to operate with standard telephones lines. They are also designed to opertate will MOST simulated telephone line services such as those provided via Cable, Fibre or ATA devices. However, because the operation of our products depends on the accuracy of these simulated services, there is a possibilty that our Faxx Switch and Duet Switches will not work. All devices are offered with a 30 Day Unconditional Money Back Guarantee. If you encounter any problems with 'Simulated Telephone Line Services', call NATCOMM on 0800 530 8645 for assistance. A Distinctive Ring Switch is designed to allow your Fax Machine to operate with a Distinctive Ring service. The Distinctive Ring service provides you with a second number for your existing line. This service is vey low cost and is available from your normal telephone service provider. There is generally no installation charge and the new number becomes your Fax Number. When Fax calls are made to the new number, a different ring is sent which Distinctive Ring Switch will detect within 1 ring. It then connects the incoming Fax call to your Fax Machine. Will operate with MOST but not all Fax Machines..